Labradorite is known as the Magician’s Stone. Its brilliant chatoyancy of blue, green and gold reflects the magical transformation of the Universe into our hearts. Its beautiful presence assists the manifestation of our heart’s desire. Its energies go beyond the physical realms, as do our own. This captivating stone has reached us from the outer reaches of Venus, the sister planet of Mother Earth. As Venus assists in Mother Earth’s Ascension at this time, so the energies of Labradorite can help you be more of you. This engaging crystal attracts the elementals as well as the elven and fairy realms. Look deep within your labradorite to find the reflection of those beings who await your instructions to co-create your world with you. Labradorite is ready to assist you to ground yourself and your desires on the earthly plane. Labradorite also, as suggested by its name, connects you to the animal kingdom. With labradorite you can break through the belief that an animal is “merely” an animal and attune to their missions on Earth. The animal kingdom and all its truths brings mankind lessons of Unconditional Love that go beyond linear time and space. 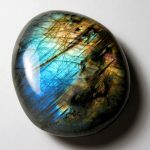 The alchemical presence of Labradorite facilitates your connecting to the higher realms too. Its golden rays bring to your awareness your own Divinity, your Higher Self and the light of your multidimensional being. Allow the Golden Ray to radiate from your crown chakra through every cell of your being and then send it deep into Mother Earth through your feet. Labradorite’s heavenly blue rays connect you to the celestial realms, where angelic vibrations abound and healing rays return on green Venusian rays of love and harmony. There is no limit to your heavenly magic, only self-imposed beliefs stymie growth and change. Allow the energies of Labradorite to open you to the greater consciousness that is available to you now. By placing labradorite on your heart and third eye you may allow new insights to facilitate your journey as a spiritual being having an earthly experience. Personal magic and miracles await you with this wondrous crystal of Labradorite, a very friendly stone.